G’Day & welcome to the Stampin’ Dreams Blog Hop where this month’s theme is New Annual Sneak Peek! Who doesn’t love seeing sneak peeks & what is coming up in the new catalogue? I know I do! My inspiration came from a couple of sources. One being a challenge that our FB Group has going as well as a sample in the new catalogue. Mind you, it wasn’t planned that way. It is just the way things pan out sometimes. For my card I’ve used the Bubble Over Stamp Set along with the Bottles & Bubbles Framelits which are both returning. I’ve teamed it up with the 2018-2020 In Colour 6″ x 6″ DSP. Oh how I love this DSP with all the lovely dots & stripes! I’ve also used lots of lovely In Colours – Lemon Lime Twist, Grapefruit Grove, Blueberry Bushel & Berry Burst Inks. I hope you have enjoyed my creation today & it has inspired you to create your own. By clicking on the link above the photo, you will be able to download a free tutorial to create your own version. The tutorial includes a list of products used, measurements (metric & imperial) plus a tutorial for the card. Please see the list below so that you can hop along & see everyone’s creations. You wouldn’t want to miss any! When I saw the sketch over at Fresh Made Sketches, I had to play along. It is so clean & simple, but sometimes these are the hardest ones to create. Anyhow, I think I have succeeded & yes I am still playing with the Color Theory DSP. My card is very simple but I think it works best with this type of DSP so it fitted in perfectly with the sketch. Thank you so much ladies for a great challenge & getting me creating out of my comfort zone. Be sure to pop on over to FMS to check out what the design team have created along with all the lovely entries. If you click on the link below you will be able to download a free tutorial to create your own card. Today I am playing along with a challenge over at Sunday Stamps. The challenge this week is “Pops of Pink“. As I’ve been playing with the gorgeous “Painted with Love” Specialty DSP ” it was the perfect choice. I’ve kept my layout fairly simple so that I could showcase the beautiful paper as well as the flower from the “Beautiful Day” Stamp Set. The sentiment is from the same set & was stamped direct onto the Whisper White in Memento Tuxedo Black. I’ve used both Pink Pirouette & Rich Razzleberry Stampin’ Blends Combos to colour my flower while the leaf has been coloured with Old Olive & Daffodil Delight. To lift the flower away from the DSP, I added a small amount of Gold Metallic Thread which I think ties it altogether. To finish it off I added a little touch of Clear Wink of Stella to the petals. If you click on the link below you will be able to download a free tutorial to create your own card. The tutorials includes measurements (metric & imperial) along with a list of supplies used to create the card. Thank you ladies for a great challenge. Do pop along to Sunday Stamps to check out all the other lovely creations. The start of the new year brings with it my very first card for a challenge. It also gave me a chance to put together a piece of CS sitting on my desk waiting to be made into something. This piece was one of the very first pieces I had created when playing with the new Brushos. IT was too good to toss out. I am playing along with the challenge over at Global Design Project where the we have to CASE (copy & share everything) the Designer. This time round is the very talented Krista Frattin who just happens to be on the Team. Thank you Krista for your inspiration. As the background reminded me something from the 60’s & 70’s I decided to use the Epic Celebrations Stamp Set which you can earn FREE while Sale-A-Bration is happening. Love this cute little set. Along with the background I decided that I was going to use the guitar from the set but wanted to cut in 1 piece so I used the Inlaid Die Cut Technique – I think that is what it is called. Thank you once again to the Design Team for your inspiration. Don’t forget to head on over to their blog to check out all the lovely creations & while there leave a little love. I have a clean & simple card for you today which has been inspired by the Global Design Project #GDP076 – Case the Designer Challenge. Hasn’t Tanja Kolar created a gorgeous card? I had been thinking about creating something with the “Butterfly Basics” Stamp Set for a couple of days now & this was just the perfect way to showcase this lovely set. I am also low on my Sympathy Cards (have a Expo coming up) so it worked in well. The Very Vanilla Card has been embossed with the Fluttering EF & then adhered to the Base Card – Elegant Eggplant. The large flower was inked using my Regals Stampin’ Write Markers – Always Artichoke & Elegant Eggplant, while the middle of the flower is Crushed Curry. The butterfly was stamped onto Very Vanilla in Rose Red before die cutting with the matching Butterflies Thinlits & adhered to the card with Mini Stampin’ Dimensionals under the wings. This is so that the wings would stay popped a little. The sentiment was stamped onto scrap Very Vanilla in Elegant Eggplant before being punched with the Classic Label Punch & adhered to the Card Front with Mini Stampin’ Dimensionals. I completed the card by adding Rhinestone Basic Jewels to the centre of the butterfly & randomly scattering a couple around the square. Thank you Global Design Team for a great challenge. Be sure to go & check out the amazing creations everyone has created. Don’t forget to click on the link below to download your Free Tutorial. I am a little late in posting my card today as I meant to share it with you this morning but got a bit carried away with doing other things & it slipped my mind. I’ve created my card using the challenge over at Global Design Project #87 where this week they have the theme of Cooking, Baking and Making! When I saw the challenge, “Perfect Mix” Stamp Set sprung immediately into my mind. This set is from the 2017 Occasions Catalogue & will be retiring at the end of May, so this is the perfect time to ink up this great set one last time. I actually created this fold last week. To check out the instructions on how I created this fold, please click here. It is the perfect way to use some of that lovely DSP sitting on your desk before it retires. I decided to play with “Playful Palette” DSP Stack which is another item retiring. I think it works in great with the set. I also used the “Playful Palette” Washi Tape which is on the inside of my card & the envelope. Gotta love it when everything matches. To create my “shelf”, I stamped random images direct onto scraps of Very Vanilla Card in Memento Tuxedo Black Ink & coloured with the Sweet Sugarplum & Peekaboo Peach Markers & Bender Pen before fussy cutting. I punched a piece of DSP with the 2″ Circle Punch & adhered to the Very Vanilla side of a Lace Doily (2017 Occasions Catalogue) & cut the Doily in half. A circle was die cut from Very Vanilla Card using the Layering Circles Framelits & running through the Big Shot before layering onto a Basic Black scallop circle which had been die cut using the same set of Framelits & running through the Big Shot. The “shelf” was adhered to the bottom part of the scallop circle with Stampin’ Dimensionals before adhering the baking images, the oven mitt with a Stampin’ Dimensional while the others were adhered with Liquid Glue. The sentiment was stamped onto a scrap of Very Vanilla Card in Memento Tuxedo Black Ink, fussy cut & adhered to the top of the “shelf”. I do hope you like my card today, I am still undecided but happy with the final result. Why not head over to Global Design Project & play along. There is still a heap of time to do so. Today’s card is one I’ve created for the Global Design Project where we had a challenge to case the designer – Michelle Last. As I am in need of a couple of special cards & having the “Love & Affection” Stamp Set sitting on my desk, I thought this would be the perfect opportunity to play with both. I also went for a colour that I haven’t used in quiet sometime – Rose Red Ink & Card. I then decided to team it with Pool Party So Saffron, Pear Pizzazz with touches of Flirty Flamingo which is what the flowers are. Although I wasn’t sure how the colours would compliment each other with Very Vanilla, I’m happy with the soft look of the card. I’m happy to say the card went off in the mail this morning, so fingers crossed the receiver will like it! 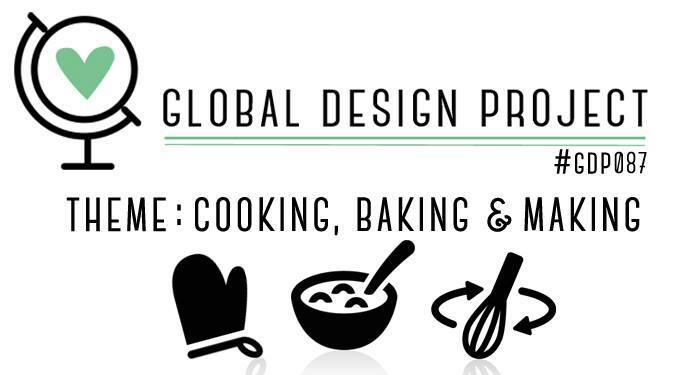 Why not bop on over to the Global Design Project Page & play along. You still have heaps of time. To grab your Free Tutorial, please click on the link above the photo. This is one of the Stamps Sets that will be retiring. To purchase your supplies to create your own card, head on over to my Online Shop. Don’t forget the Retirement List. Items are selling out fast! Once gone, they are gone forever! When placing an order Online, don’t forget to use April’s Host Code.